Villa Palomina situated on a hillside near Cefalu . 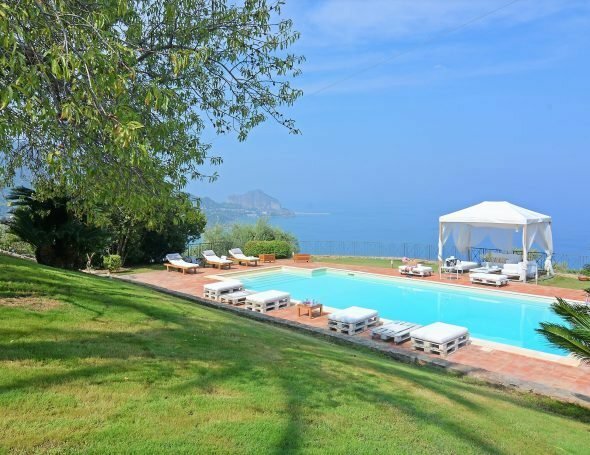 Villa Palomina is a beautifully restored two-story villa situated on a hillside near Cefalu Sicily with pretty gardens, a pool, and gorgeous sea views. Restored with care and furnished with style, the villa and grounds offer plenty of space to relax in beautiful surroundings. The interiors have a ‘contemporary coastal’ look with whitewashed walls and wooden beams, grey floors and well-chosen fabrics and furniture made of natural materials. The living and dining and kitchen areas are on the ground floor, while upstairs there are two double bedrooms with en-suite bathrooms which work well for two couples. A further bedroom with four single beds and a family bathroom make Villa Palomina ideal for family groups. The villa is not suitable for children under eight years old. Ground floor: Living room, kitchen, smaller sitting room, guest toilette. First floor: Two double bedrooms with en-suite shower rooms, family bedroom with four single beds and a separate bathroom with shower and bath. Outside: a large partially covered terrace is the place to dine in style and relax. The patio leads to an attractive garden with its palm trees and a variety of plants. A pool (size 10m x 5 m deep 1,5) with decking and sun loungers sets the scene for relaxing in the Sicilian sun. The coastal town of Cefalu is just a 15-minute drive away for shops, restaurants, and a long, sandy beach. Cefalu charms in off-season We just finished a two-week off-season rental at Villa Palomina in Cefalu. We thoroughly enjoyed our stay. The villa is tastefully decorated in a minimalist way, with rustic charm and cool, quirky features, such as antique grinders for cheese as well as salt and pepper. We did a lot of cooking there, and the older cookware and utensils were fun to use. We also did a cooking class on site arranged by the property managers (thanks Angelo!) This was also a lot of fun. We made fresh ravioli. It was the best pasta we had on the trip, and by a considerable margin. We also learned to make pastella, which we had never had before. With the fresh local greens and herbs, it makes great appetizers! Saluti Chef Nino! The view from the villa is spectacular, and there is much to see and do in Cefalu and the surrounding hill towns. The property managers made good suggestions about things to do, and were responsive to our requests, when for example, the wifi temporarily stopped working. 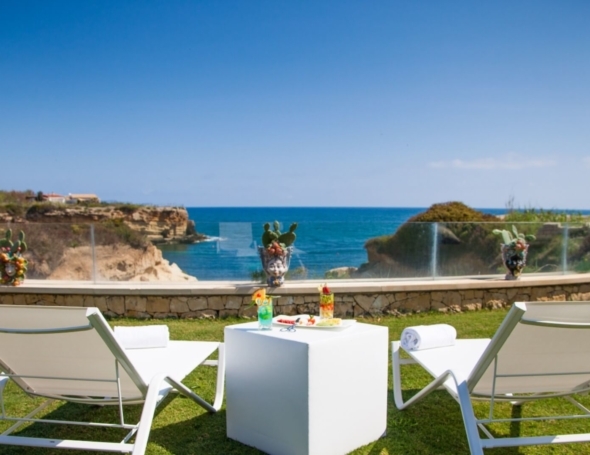 Villa Palomina is a quality property in a stunning location. Top marks for accommodation and service. Villa Palomina is a very tasteful restoration with great grounds and a most incredible view from 1,650 feet above the sea with Cefalu’s ola town prominent. The layout with 3 bedrooms & 3 1/2 baths is very functional. There is no air conditioning but the fans in each bedroom are pretty effective. The pool is very nice and of good size, but for shade one must retreat to the terrace East of the house. The kitchen is pretty well equipped, lacking only a few things like sharp knives and a toaster. The WiFi is spotty, but mostly serviceable through most of the house. The biggest drawback we noticed when there in July was the windows lack screens and mosquitos and yellow jackets are present some times of the day It is only about 15 minutes to Cefalu, but it is a narrow, windy, curving road. The last bit to the villa is especially tight; our larger van could barely make it, but we got used to it over time – the price to be paid for the view. Overall we highly recommend it. We spent a wonderful week at Villa Palomina and I cannot recommend it enough. Every aspect of the villa has been designed to perfection, the attention to detail was second to none. Total privacy and spectacular views. The photos do not do it justice, a truly wonderful villa which I hope to visit again. We have just returned from a week at villa Palomina where we had the most fabulous stay and would 100% return again. The villa is done up in a beautiful chic style both inside and outside. The photos don’t even portray the true magnificance of this outstanding villa. The panoramic views are breathtaking from both the pool and the seating area. The villa is looked after by Stefano who was constantly on hand throughout the week and one of the most charming, helpful and enthusiastic people we have ever met! All in all we couldn’t recommend this villa more to people who are looking for a totally secluded, picturesque and lavish escape in the Sicilian mountains. 10 out of 10! We just finished a two-week off-season rental at Villa Palomina in Cefalu. We thoroughly enjoyed our stay. The villa is tastefully decorated in a minimalist way, with rustic charm and cool, quirky features, such as antique grinders for cheese as well as salt and pepper. We did a lot of cooking there, and the older cookware and utensils were fun to use. We also did a cooking class on site arranged by the the property managers (thanks Angelo!) This was also a lot of fun. We made fresh ravioli. It was the best pasta we had on the trip, and by a considerable margin. We also learned to make pastella, which we had never had before. With the fresh local greens and herbs, it makes great appetizers! Saluti Chef Nino! The view from the villa is spectacular, and there is much to see and do in Cefalu and the surrounding hill towns. The property managers made good suggestions about things to do, and were responsive to our requests, when for example, the wifi temporarily stopped working. Villa Palomina is a quality property in a stunning location. Top marks for accommodation and service.